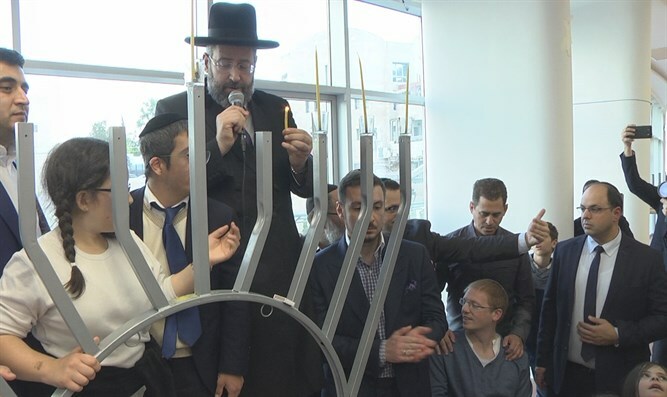 Israel's chief rabbis and the most severely wounded soldier from 2014's Protective Edge celebrate Hanukkah together at center for disabled. Sephardic Chief Rabbi Yitzhak Yosef and Ashkenazic Chief Rabbi David Lau celebrated the third night of Hanukkah with wounded IDF soldier Yehuda Yitzhak Ha’Yisraeli and hundreds of disabled people and supporters. The celebration, held at the Shalva National Center in Jerusalem, included the welcoming of a new Torah Scroll to the center’s synagogue. Yehudah Yizhak Ha’Yisraeli, a soldier in the elite Rimon unit, was critically wounded during 2014's Operation Protective Edge in Gaza. He remained in a coma for over a year, surrounded by his parents and family who never stopped believing that he would recover. Hayisraeli miraculously woke up and today is in the midst of an intense rehabilitative process,revealing unbelievable inner strength despite challenging difficulties. Hydrotherapy sessions at the Shalva National Center’s hydrotherapy pool are a significant element of his rehabilitation. Together with friends, supporters, and many of Shalva’s children, Hayisraeli helped to light the candles and assisted the scribe in completing the writing of the Torah scroll. Kalman Samuels, Shalva’s founder, spoke during the lighting ceremony and expressed emotionally how appropriate it is to commemorate the Hanukkah miracle with Hayisraeli. "Just as the Maccabees succeeded against all odds so, too, our Yehudah Yitzhak, the most seriously injured soldier of Tzuk Eitan (Operation Protective Edge - ed. ), continues to defy all odds in fully recuperating from his injuries. Shalva is so proud to be able to help the entire community including our dedicated protectors of the IDF," Samuels said. Rabbi Lau said, "Hanukkah is a festival of light and every day during the eight days we add light to illuminate the spiritual heroism of the Maccabees, who did not seek to further themselves but to illuminate the light in the Holy Temple. So too at Shalva, people like Yehuda Yitzhak, a true Israeli hero and many other good people. Shalva helps and gives them everything to continue with their lives. Let's take this lesson and seek to bring light to others." Philanthropists Lazar Safaniev and Ervin Ilizirov generously donated the Torah, flying in from Moscow for the celebration. All were entertained by wonderful music by the Shalva Band and a festive meal prepared by the Shalva Cafe for the celebrants. "On this festival of light you have brought light into the lives of Shalva’s children with this wonderful gift," Samuels remarked, addressing the donors and guests at the festivities. Shalva National Center's synagogue is a meeting point for the general public and individuals with disabilities, for prayer and for learning. A model of religious inclusion, the synagogue is active during the week and weekends. The windows of the synagogue feature beautiful mosaic works donated by a Mexican artist. Shalva, the Israel Association for Care and Inclusion of Persons with Disabilities, was founded 27 years ago based on the belief that the responsibility of caring for individuals with disabilities does not belong solely to the families into which they are born. Rather, individuals with disabilities require and deserve support from the broader community and to be included as equal members of society. To this end, the organization operates inclusion-promoting, rehabilitative programs for people with various disabilities around the clock.